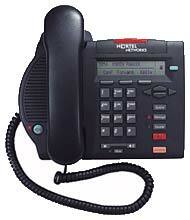 The Nortel 3902 phone is a single-line basic phone with display-based interface and hands free capability. The M3902 is designed for light telephone use with more feature requirements for the Nortel Option PBX platform - 11C, 51C, 61C, 81C. They work great in areas like manufacturing areas and warehouses. The M3902 introduces the display based interface and handsfree capability to a single line phone. Enhancements such as self labeling keys, "Smart" Mute and a host of user selectable options make this a powerful single line set. The M3902 also increases its capabilities by supporting a cartridge accessory that conveniently snaps into the back of the phone. Local telephone companies: Buy Meridian 3902 phone sets at wholesale prices for your rental phones program.